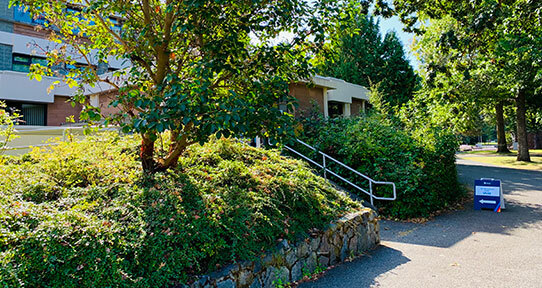 The Psychology clinic is housed in the Cornett building on the UVic campus. The Psychology Clinic in the Department of Psychology, University of Victoria, is a training facility for clinical psychology graduate students. As part of this training, we provide professional psychological services to the community, including assessments and therapeutic interventions for children, adults, couples and families. Services are provided by students in the M.Sc. and Ph.D. clinical psychology programs under the supervision of Registered Clinical Psychologists. The Psychology Clinic seeks to provide intensive applied training experiences for graduate students, as well as effective, ethical, and economic psychological services for the community. Our Mission: To work with individuals and communities to improve health. We provide care, educate, conduct research, and advocate. Our Vision: To foster healthy individuals and communities by applying specialized psychological knowledge in a teaching outpatient clinic setting. Accountability: We are responsible for providing superior client-centered services in a manner that shows recognition of effective resource management and modeling of professionalism to student-trainees. All services are provided with consideration of the practice standards set by the College of Psychologists of British Columbia (CPBC). Respect: Our services, relationships and actions convey our values of integrating compassion and caring with the highest training ideals in the professional preparation of clinical psychology graduate students. Diagnostic assessments: We offer psychosocial, psychoeducational and neuropsychological assessments. The purpose of these assessments is to provide diagnostic clarification, an understanding of each individual's unique situation, and recommendations for appropriate interventions. Psychotherapy: We offer psychotherapy to individuals, couples and families with the goal of assisting individuals to gain greater insight into their problems, cope more effectively with personal stresses and interpersonal conflicts, and achieve behavioural goals. We strive to provide empirically-supported interventions whenever possible. Please note that the Psychology Clinic is not able to respond to the needs of individuals requiring psychiatric hospitalization, treatment of severe substance use, or immediate help in a major crisis. Generally we are also unable to help individuals with current or upcoming litigation or legal problems. Special Training Considerations: The Psychology Clinic has the dual purpose of serving the community and training clinical psychology graduate students. As a result, all assessments and therapy sessions are videotaped so that Registered Psychologist Supervisors can review them for accuracy and supervision purposes. The Psychology Clinic aims to be of service to the community within the limits of its staffing capacity. At times we may have long waiting lists for some services and we may recommend that you seek services elsewhere. Our ability to provide services varies depending on course offerings, practicum student enrollment, and the availability of supervisors. Following are estimates of our current wait times. We try to update this information as often as necessary (status updated: April 4, 2019). Assessment – Child Psychoeducation: Not currently accepting referrals. Waitlist is closed until May 1, 2019. IMPORTANT: ALL REFERRALS RECEIVED PRIOR TO THIS DATE WILL BE DECLINED. See PDF doc for additional important information (Please note: this does not include MCFD referrals). Please contact Clinic Secretary Lori-Ann Larsen for more information (250 721-7538). The Psychology Clinic is a fee-for-service clinic. For psychotherapy, we offer significantly reduced flat fees. We do not offer a sliding-scale fee for psychotherapy services. Kimberly Kerns, Ph.D., R. Psych. Marsha Runtz, Ph.D., R. Psych. Colette Smart, Ph.D., R. Psych. Holly Tuokko, Ph.D., R. Psych. Erica Woodin, Ph.D., R. Psych. Claire Sira, Ph.D., R. Psych. Wally Craver, Ph.D., R. Psych. Tony Dugbartey, Ph.D., R. Psych. Lisa Van Bruggen, Ph.D., R. Psych. All student trainees that provide services at the Psychology Clinic are enrolled in the Clinical Psychology Graduate Program at the University of Victoria. In arrangement with the copyright holders, the Test Sales office produces and sells a limited number of neuropsychological test materials. These tests were primarily designed for use with children and adults with known or suspected brain lesions. These test materials are not available for sale to the general public as they were designed to be used by qualified health care professionals with appropriate training and expertise in neuropsychology. Individuals interested in purchasing tests from our office will be required to provide in writing verification of their assessment qualifications. Test Sales proceeds go towards supporting the Test & Book Resource Library at the Psychology Clinic, Clinical Psychology Training Program at the University of Victoria. Contact psyctest@uvic.ca for test ordering queries.